In the process of making this decision, I weighed a few important factors. I also thought through all the logistics of making and transporting a wedding cake. While most girls dream about their wedding dress or venue, I daydream about my wedding cake. How I’ll decorate our cake, what flavors it will be, even what cake stand I’ll put it on! I’m not saying this is the right decision for most people, but it felt right for me. Making my own wedding cake is something I’m looking forward to. It’s just an added bonus that it’s a great way to save money!! It’s no secret that I am extremely frugal! The thought of paying someone else to do something I’m capable of doing myself seems silly. 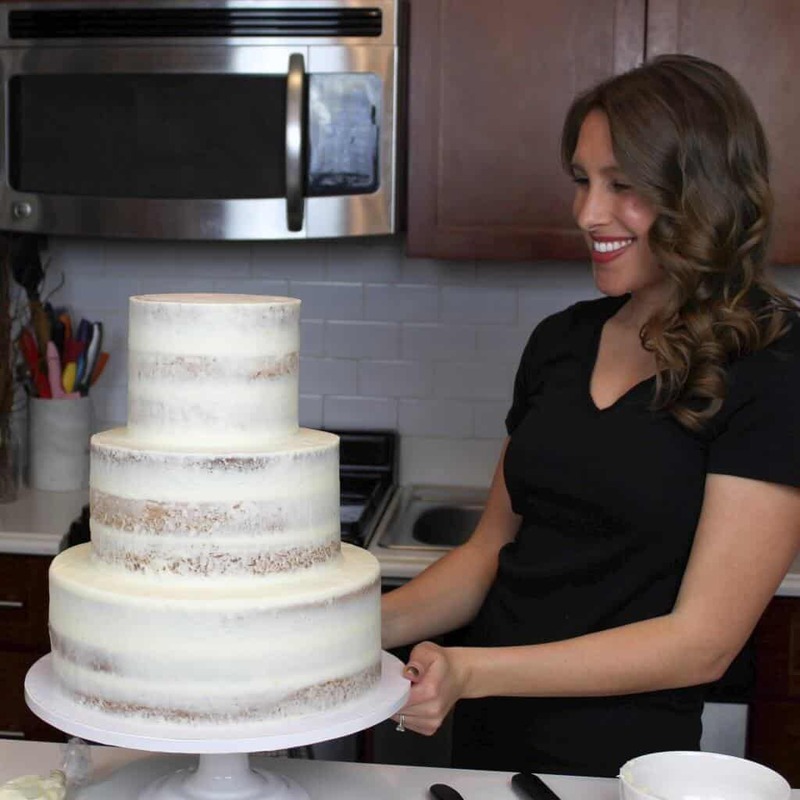 Tiered wedding cakes can be extremely expensive, and making your own wedding cake can be a great way for to save money. Wedding cakes usually run $4-$6 per serving. With that in mind, the price of a wedding cake can add up quickly if you plan to have a big wedding!! 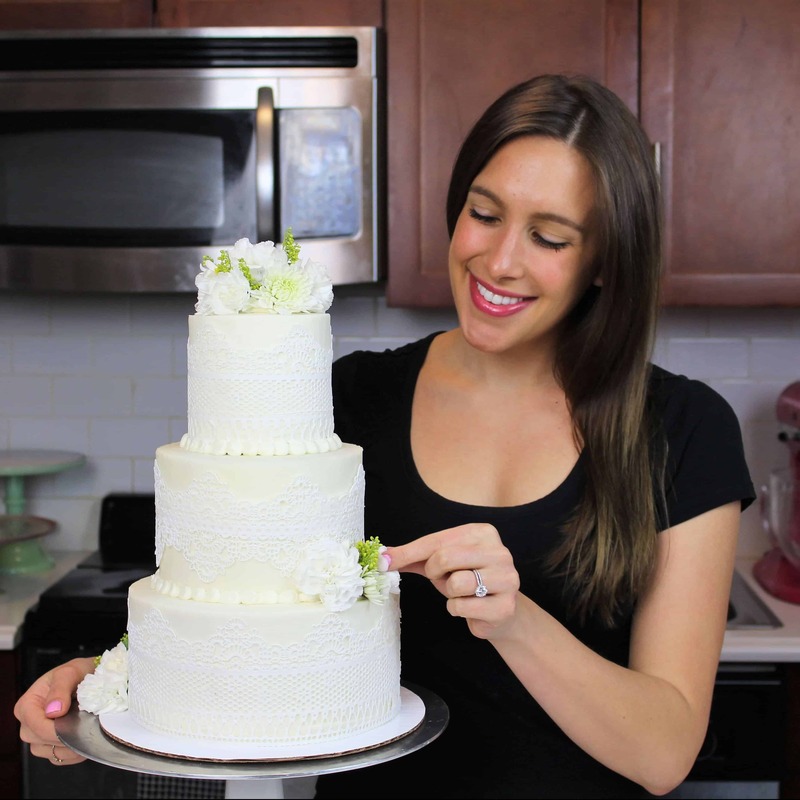 If you’ve never baked before, and are mainly focused on saving money on your wedding, this might not be the best area to do it. When money is the driving force behind your decision, it’s important to remember that you have options! There are great alternatives to traditional wedding cakes. These include making several individual cakes, cupcake displays, donut towers, or even cookie tables (my fiance is from Pittsburgh). 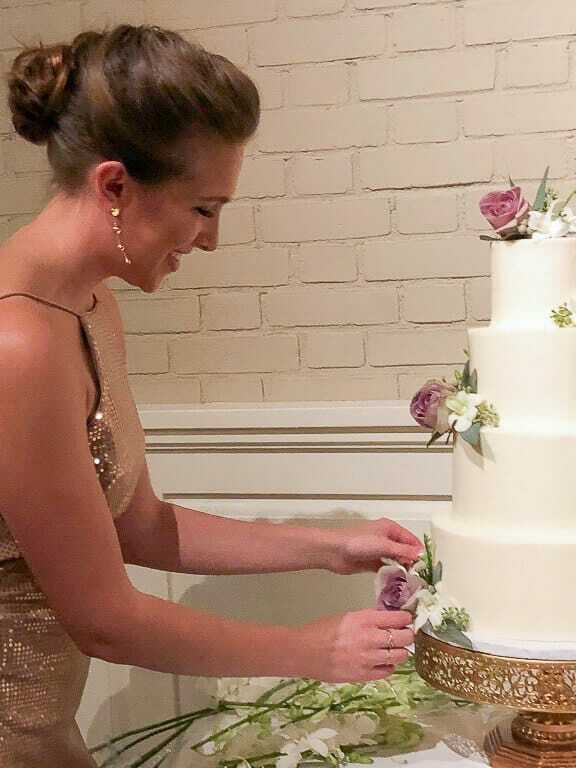 Making a wedding cake is a big commitment. It takes hours of work, a lot of planning, and a specific skill set. If it’s a forced decision, it can add a lot of stress to your wedding day! I feel very comfortable baking, and have some experience making tiered cakes. While making a wedding cake is no easy feat, I don’t feel stressed out thinking about making it because I have done it before. I highly recommend making at least one tiered cake before you make this big of a decision. 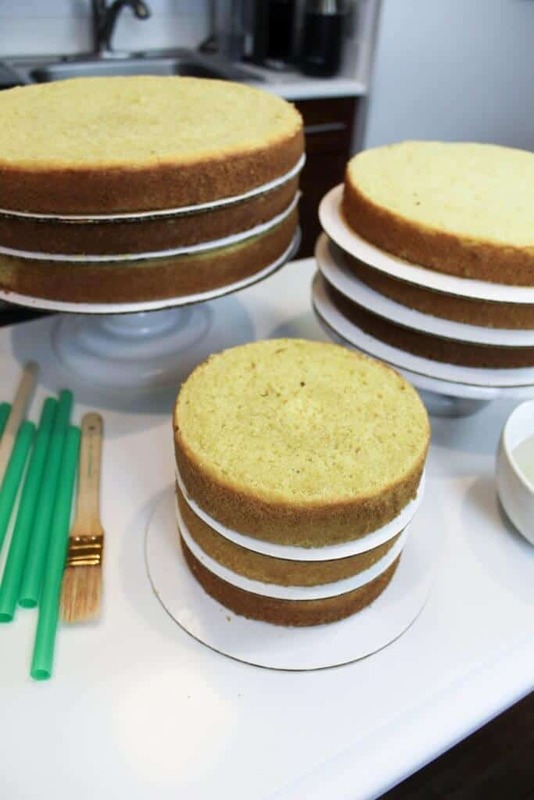 It will help you realize the amount of effort it takes to make a tiered cake. Whether you have a lot of experience with baking or not, it’s important that you commit to making a practice cake. I suggest doing a test run with the cake flavors and frosting you plan to use. It’s also a great idea to test the style of decoration you want for your cake. Making a test cake makes sure the cake design you have in mind is doable, and will turn out how you picture it. Sometimes we have a wonderful idea, but the execution of it isn’t always quite the same 😛 This happens to me all the time, and I fully intend to practice my wedding cake design before my big day. The saying practice makes perfect exists for reason! Practice will also help increase your confidence, and give you peace of mind when it’s time to make the real cake. Another reason I feel confident I can make my own wedding cake is that I plan to make it ahead of time! I have blocked off a few days the week of my wedding, to prep the layers and frosting. This will allow me to take care of a lot of the time consuming baking before my family gets into town. 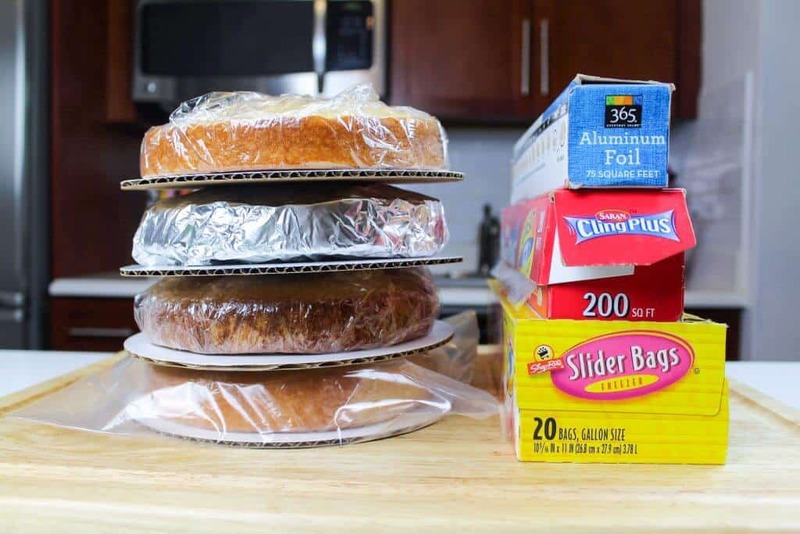 Cake layers can be made weeks in advance, if wrapped and frozen properly. Buttercream can be made weeks ahead of time too! Breaking up the workload also makes the process a lot more enjoyable. It allows to you take a breather between all the baking, and the decoration of the cake. This will allow you to put all your creative energy into the design and decoration of your cake. In the off chance something goes wrong (you burn you cake layers, run out of sugar, etc. ), it will also give you time to fix the situation! While this may seem counterintuitive, baking the week before my wedding should help me be LESS stressed out! I’m a bit of a busy body, and I’m happiest when my hands are busy and I’m working on something. Baking is extremely therapeutic for me. I think baking will really help me de-stress and clear my mind during the week of my wedding. There’s also such a sense of satisfaction and accomplishment that goes along with making a cake, especially a tiered cake. Another factor that made this decision easy? We are picking a very simple cake design! Our wedding cake will be decorated with the same fresh flowers that are in the bouquets. I know that I’m not a master sugar artist. I also hate working with gum paste! By using fresh flowers to decorate our cake, I’m not going to be killing myself making sugar flowers. I will simply wrap the stems of the flowers using floral tape, and secure some of the stems into the cake with straws. I also don’t have to worry about painstakingly hand painting details onto my cake the week of my wedding. It’s important to play up your strengths, and be realistic about your skills as a baker. Once you’ve made up you mind to make your own wedding cake, there are still some details that need to be considered! Be sure to check with your venue that it’s alright to bring in an outside cake. Some wedding venues will only allow you to work with certain vendors, or will charge a sizeable cutting fee for outside cakes. We’re pretty lucky, and our venue was super flexible with us bringing in our own cake. I spoke with the manager of our venue, and confirmed I’ll be able to drop the cake off the morning of our wedding. Once you’ve confirmed that you can bring in your own wedding cake, be sure that you have a solid transportation plan in place. You will need a large car, and a sturdy cake box. Living in Manhattan has made transporting tiered cakes quite…interesting! I’ve successfully delivered tiered cakes using an Ubter three times (knock on wood). I don’t have a car, but find that Uber XLs actually work great for cake deliveries. I hop in the back, and hold the cake in my lap until we get to the venue. If you have a car and need to drive to the venue, I recommend place the cake box on a flat surface! For most large cars (SUVs, cross overs, etc. ), it’s easiest to put the cake in the back or the trunk. Place a non slip mat under the box, to keep it from sliding around during the drive. 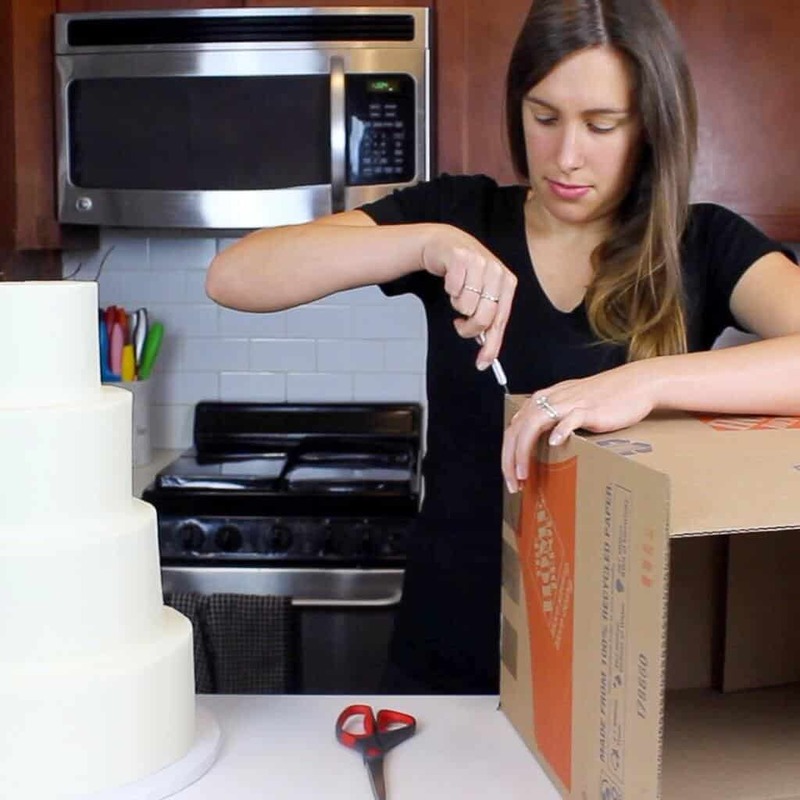 For the wedding cake box, I use large moving boxes that I buy at Home Depot (as shown at the end of the tutorial below!!). They’re extremely sturdy, and cost less than $2! It may not be the prettiest box, but usually no one from the wedding will see it. I’ve found that assembling the cake before transporting it to the venue is usually less stressful. However, some people prefer to stack the tiers on site. It all comes down to your preference, and your means of transportation. 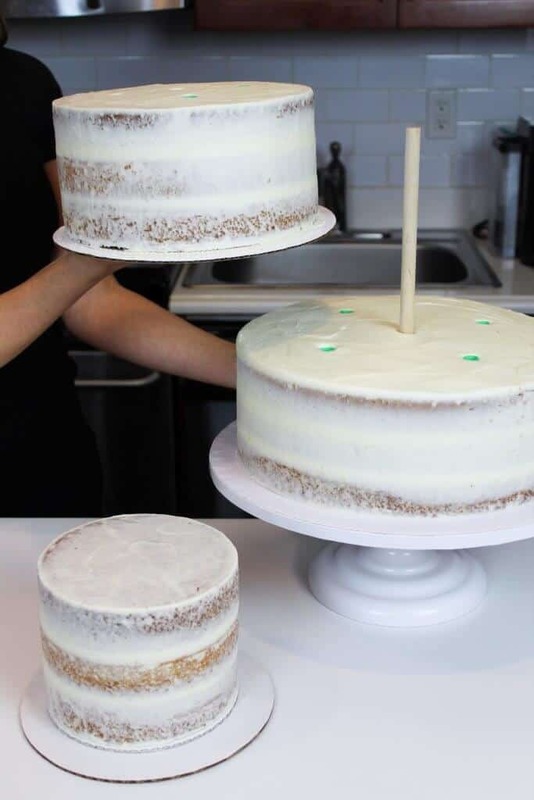 I like to assemble the cake at home, so I can fill in any gaps between the tiers with the help of some extra buttercream and my spinning cake stand. It also allows you to do all the hard work before getting the venue, or even the day before your wedding. If you’re going to put all this thought and time into making your own wedding cake, you want to be sure it’s properly supported! 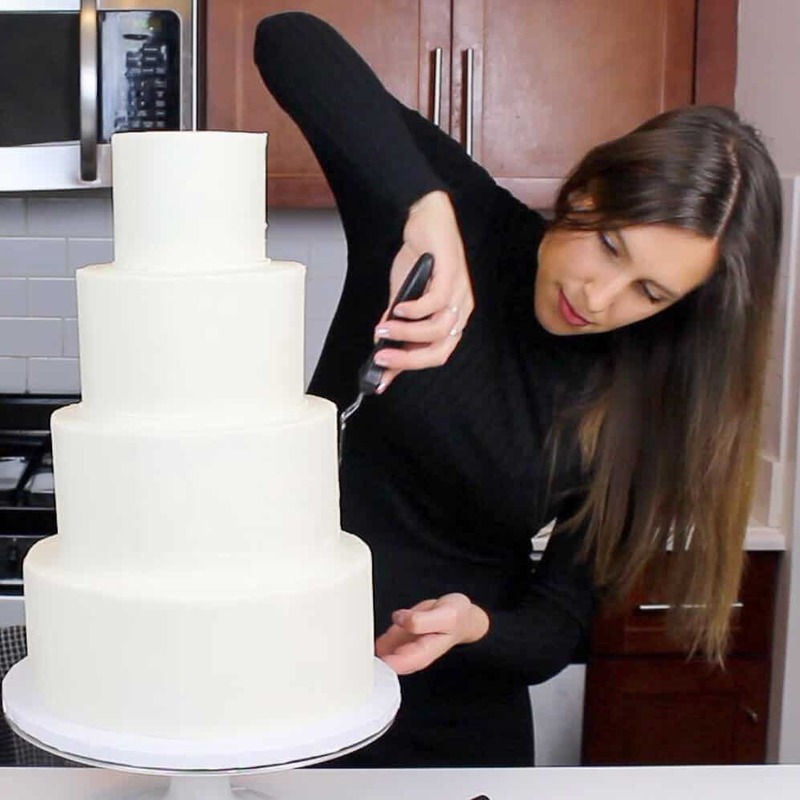 To ensure your wedding cake can support its own weight, and keep its shape the day of your wedding, it’s crucial that the cake is built with supports in each tier! Some people use wooden dowels for this, others use bubble tea straws (sounds crazy, but they actually work very well). I prefer to use bubble tea straws, because they’re easier to cut. Wedding cakes also usually have a thick central wooden dowel, which helps keep the tiers centered. It acts as a guide as you stack the tiers on top of one another, and keeps your tiers nice and stable. I’ve made wedding cakes using my vanilla layer cake recipe, my chocolate cake recipe, and my lemon olive oil cake recipe. What size cake layers would you recommend for a 3 tier wedding cake that needs to feed 130 people? Your such an inspiration! Can’t wait to see what your wedding cake looks like. When adding the simple syrup do you add it to a room temp cake or cold cake? And if its room temp do you then chill cake before frosting? I add the simple syrup usually when the cake layers are at room temp with wedding cakes, just because by the time I’ve leveled and trimmed them, they’re usually fully thawed 😛 So I frost them at room temp, but I always chill my crumb coat before adding a second layer of frosting <3 You could add the simple syrup when the cake layers are slightly chilled though if you wanted! 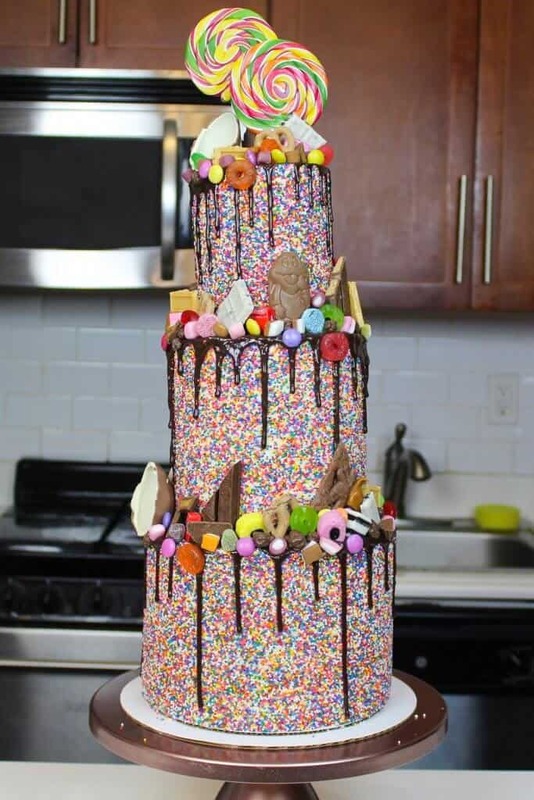 I’d love to watch you assemble the large tiered cakes! (The video isn’t working for me) This is the hardest part to tiered cakes for me! Getting them stacked and TRANSPORTED!! AHHHHH that part is nerve wracking as can be! sorry about that! It’s working now ?? Mad props to you for making your own wedding cake! I’m sure it will be beautiful! Hi love this tutorial, my question is the wooden central dowel goes through the first 3 layers but not the 4th one or so it seems?! Can you advice? Did u put another smaller central dowel in the 3rd layer to conect the 4th! I watched the vid a good few times! Just confused but this final part! haha you are totally right! I ended up using two dowels. I really wanted to use that thick one I started with, but it was a bit too short. I added in a second dowel between the third and fourth tier to keep the top tier secured! Do you have any recipe on your red velvet cake? Wedding cake, , I am just like you, I make things ahead of time, that way I am more prepare. so it’s much easier. Thanks so much for this! Congrats on your upcoming nuptials! If you make this the day before the wedding and stack it, do you put it in the all the fridge or leave it out? How many cups of batter works you use for a ten and 6 inch pan? Since the recipe is for 8 inch pans..
Hi Laurie! I’m actually working on a guide right now that will share how many cups of batter you need for different sized cakes, and how to know how many batches of batter you need 🙂 stay tuned, hoping to share it later this week! What size is the center dowel that you used. Where do you find dowels like that? Fantastic!!? thank you for sharing. 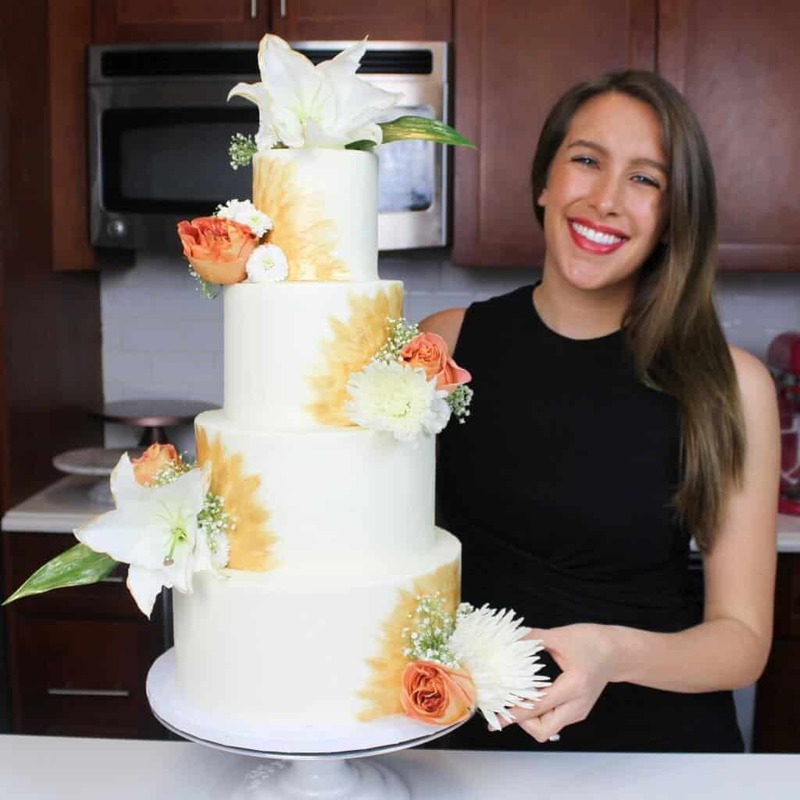 How many people did the wedding cake in your video feed? Hi, I am going to make your vanilla cake (found on Instagram) for my sister’s birthday this weekend. I am usually a pound cake baker. So this will be my first time and exciting time to attempt a three layer cake. I just need to know how many cups of batter into each pan so that it will come out even. Sadly I don’t usually measure by cups, but rather go by grams! one batch makes about 1800 grams, so if you want to make three layers you can fill each pan with about 600 grams of batter <3 Hope that helps! !